Digital media exposure for children of all ages should be limited, according to new guidelines from the American Academy of Pediatrics. Previously the Academy set a general screen time limit: no more than two hours in front of the TV for kids over age 2. Today, in a world surrounded by digital media 24/7, defining screen time is difficult. The academy recommends that for children 2 to 5 years of age, screen time should be limited to one hour per day. For kids ages 6 and older, parents can determine the restrictions for time spent using screen, as well as monitor the types of digital media their children use. Babies are most vulnerable to screens. 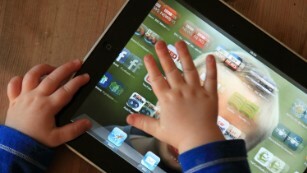 Infants aged 18 months and younger should not be exposed to any digital media, the academy says. Osmo has made its mark with award-winning augmented reality iPad games for children, and now it’s launching another one: Osmo Pizza Co., where kids learn how to run a pizza shop and develop entrepreneurial skills. It’s another magical way to teach kids how to run a business, make change, and keep customers happy. The title is the third game that Palo Alto, Calif.-based Osmo has launched this year, and it once again uses the iPad camera and a simple mirror to create an augmented reality experience for children ages 5 to 12. With Osmo Pizza Co., you attach a mirror to the top of an iPad, enabling its camera to see what is immediately in front of the tablet. Then you start the game, responding to customers who ask for a certain kind of pizza. You place faux pizza dough in front of the iPad. Then you quickly place pizza toppings on top of it, fulfilling the customer’s order. The magic comes in as the iPad camera, with the help of Osmo’s artificial intelligence software, recognizes the objects thrown in front of it. If you have put the correct pieces in front of the tablet, the app generates a positive response. It recognizes the pizza toppings and checks to see if you got the order correct. After the customers eat the pizza, they pay you, and you make change by putting physical currency in front of the camera. The tablet recognizes the correct amount and shows the math on the tablet screen. Introducing ‘Mover Kit,’ the toy kids build by simply connecting the electronics case and accessories. Are Virtual Reality Headsets Safe for Kids? Virtual-reality headsets are likely to be at the top of many kids’ wish lists this holiday season, but with many VR devices coming with age restrictions, is the technology safe for youngsters? The Oculus Rift and Samsung’s Gear VR headsets are recommended for ages 13+, while Sony’s recommendation for its PlayStation VR is ages 12 and up. HTC’s Vive is not designed for children, according to the company, and HTC said young children shouldn’t be allowed to use the headset at all. And Google said its relatively low-tech Cardboard headset should be used by kids only under adult supervision. Companies have offered little explanation for these age recommendations. So what does the science say? According to Marientina Gotsis, director of the Creative Media & Behavioral Health Center at the University of Southern California School of Cinematic Arts, not a lot. Plan Well, Pack Well, Live Well with Project Lunchbox: Let's Eat!